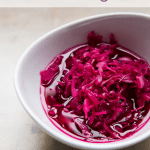 When you need that balance of acidic flavors this quick pickled cabbage is here for you! 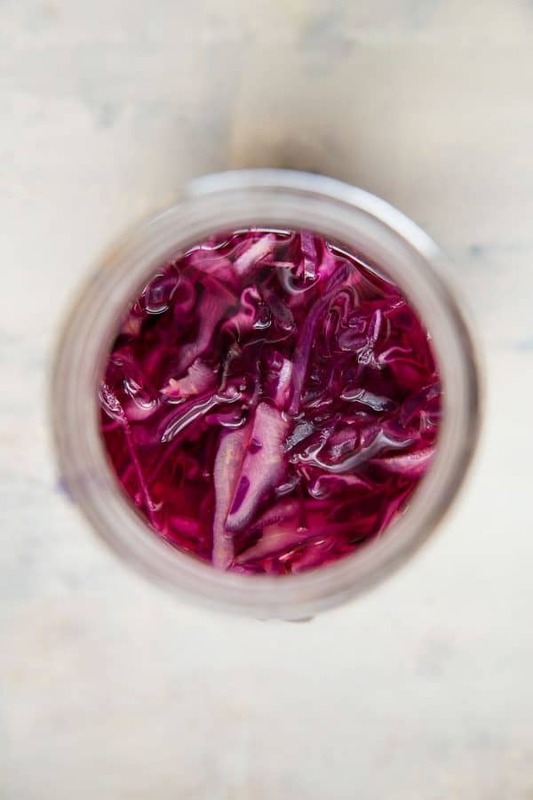 Beautiful, bright purple colors of this red cabbage are a pop of natural color to make any sandwich pop with tangy vinegar and a touch of sweet. 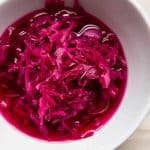 Sandwiches, tacos, burgers… quick pickled cabbage is first and foremost, ridiculously easy to make. 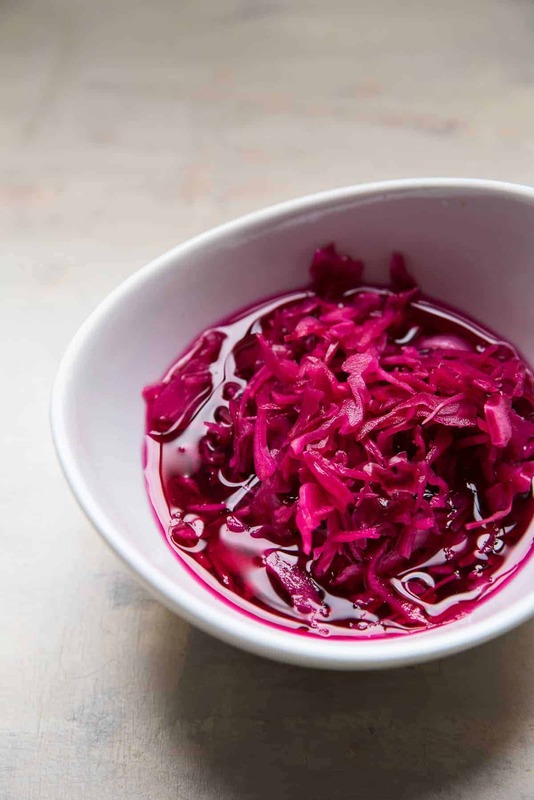 So besides being naturally, super colorfully amazing, pickled red cabbage comes together in no time, and I think that’s something we can all appreciate. Any way you like, really! You know, like most things, do what makes you happy. 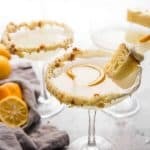 But in a foodie way, that vinegary pickle acidic tang is the perfect yin to the yang of any rich sauce, like aioli, or to balance out the fat in other eats – think burgers or charcuterie. 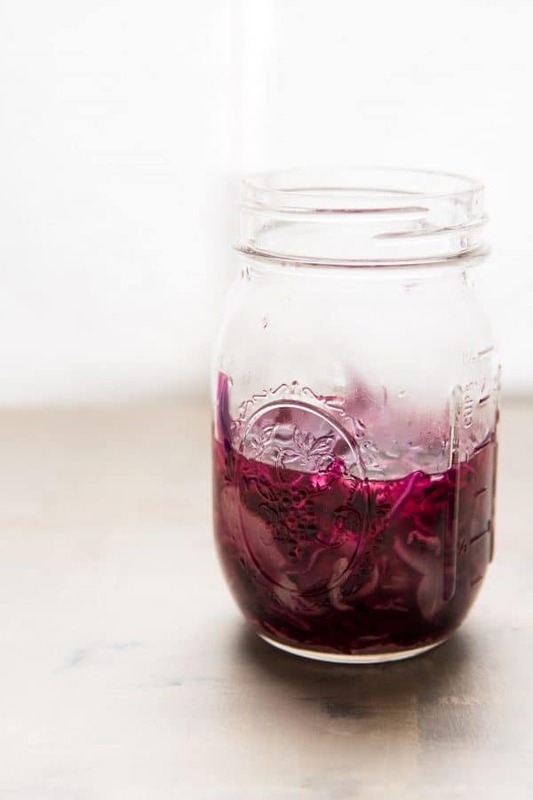 Quick pickled cabbage will add not just flavor, but when using red cabbage the color is out of this world. It’s a little purple, a little red and kinda fuscia. Our favorite way to crush on this cabbage is on tacos. The melty cheese and toasty tortilla are great on their own, but a little pop of acid with the texture of the crunch is really going to bring your tacos to the next level. The best part is you can customize your pickled cabbage to your choosing! So if you want to add spice or maybe sliced carrots or switch up the type of vinegar, it’s all good! 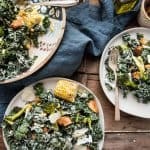 Are you ready to make yourself some tangy, crunchy goodness in no time? It’s very, very simple. 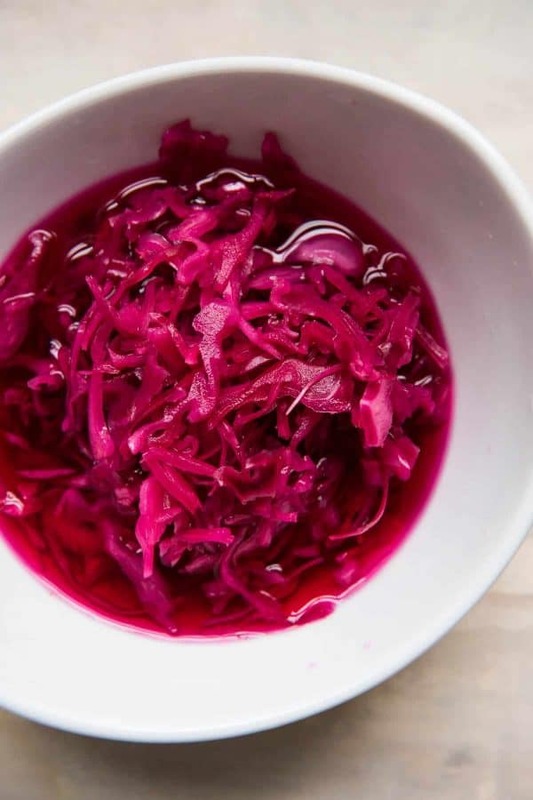 In the container you plan to use for your pickled cabbage, add the vinegar, sugar, and any spices you want. Black peppercorns are usually my go to, but just vinegar and sugar are well balanced flavors on their own. 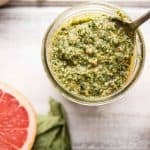 Shake or stir everything to combine. Set water to boil in either a tea kettle or sauce pan. 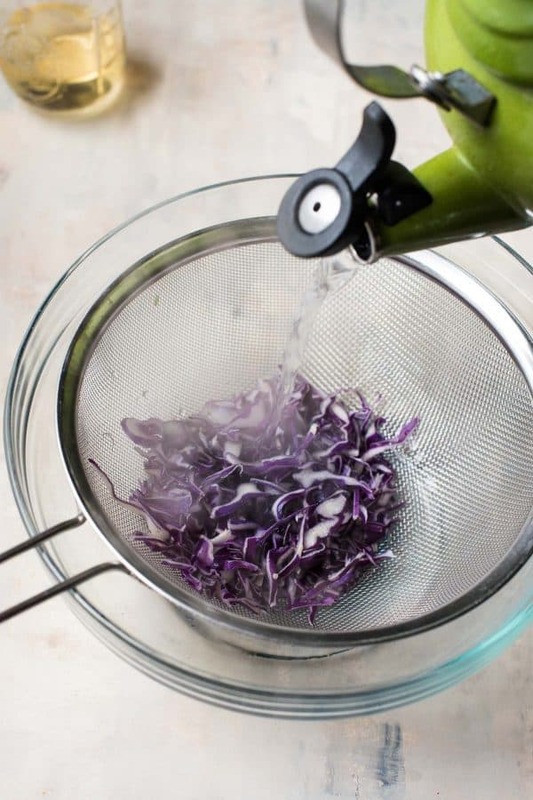 Pour the hot steaming water over the red cabbage in a colander. 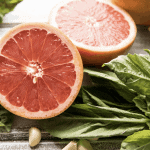 Shake off the excess water and transfer to the jar with the sugar-vinegar mixture. Then all you have to do is patiently wait 30 minutes and your quick pickled cabbage is ready to go. 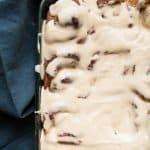 The flavor will get better the longer it sits, up to 3 days. 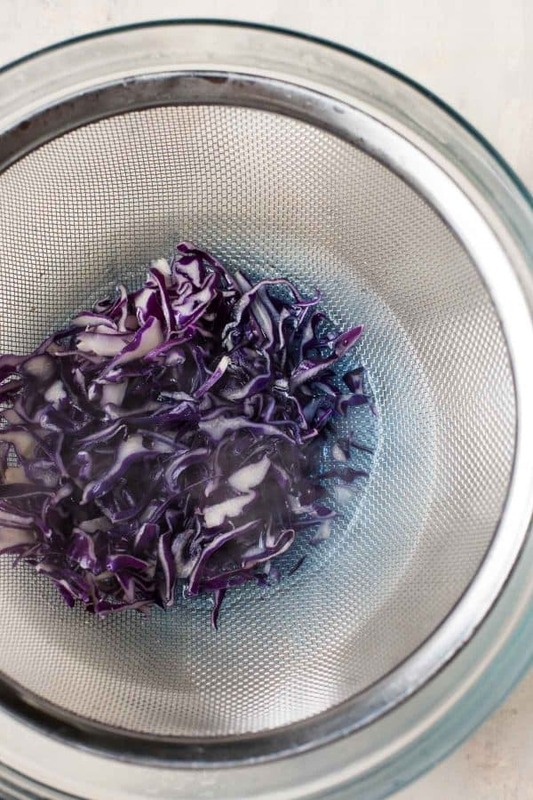 How are you planning to use your quick pickled cabbage? Spill your plans in the comments!